Today when I went out to work on the bus I noticed I had a visitor. 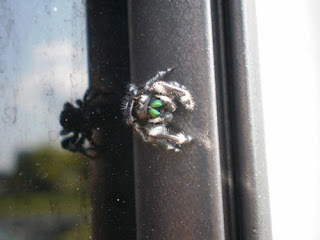 He (or she) was sitting on the window of the door to the bus. Ok...I know many of you out there have arachnophobia but here me out. We have these spiders that live around here that are the coolest spiders ever. They are jumping spiders or Salticidae. 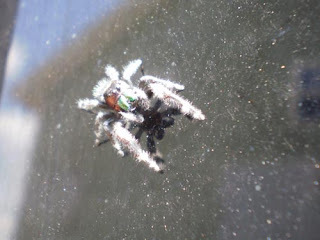 They are called jumping spiders because they have the ability to jump around 30 times their length. These spiders (if given a chance to live) actually show personality. Call me crazy LOL! They are the only spider I can't kill. You will notice how in every picture it looks like the spider is looking at the camera. Why? Because it is! These little guys are very attentive and actually move to look at you. You just have to marvel at God's creativity. 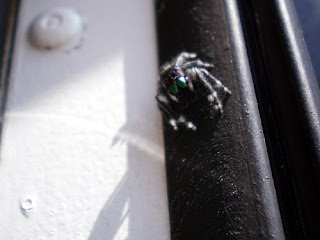 This particular spider was black with white spots and bright green mandibles. If you ever see one of these in your window sill, take a breath. Don't run to the nearest fly swatter. Instead, see if you can find a fly buzzing around the room. Injure the fly by removing a wing or something and place it near the spider. It is the coolest thing to watch. The spider will spring upon it's prey and have a tasty meal and entertain you at the same time. Maybe it is just a guy thing but I think these little bugs are cool. They keep your windows free of bugs (besides itself of course) without spinning a web. 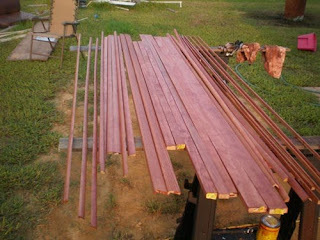 Today was staining trim board day. We are doing our best to match the color of the flooring (still yet to be put down). 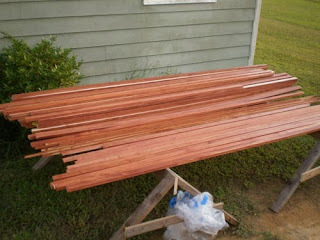 Minwax makes a color called Gunstock that looks like it matches very well so we choose it as our color. 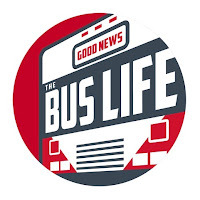 The bus will have a 2 tone look. All trim will be the same color as the floor. Hope it turns out good. Here is the other stack stained and ready for varnish. There is supposed to be rain tomorrow so I am not sure what I can do. We will have to see! 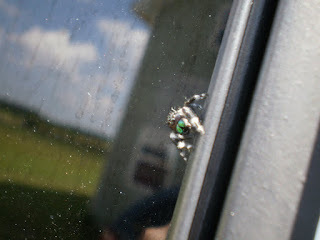 It's not just a guy thing, I'm a woman and I love jumping spiders, too!